Here's a recipe which I kind of invented myself. Well, modified. Whatever. It is a yummy, relatively healthy, easy to cook vegetarian main. A frittata is like a thick omelette. Because it is so thick, you cook the bottom half on the stove and transfer to the griller to cook the top half. Asparagus is in plentiful supply in Australia at the moment, in fact I saw some for 99c a bunch at the greengrocer's today. I think it is only worth eating when it is fresh (certainly never out of a tin). feta cheese - about 250 g ought to do. I usually use a block but I am trying a tub of marinated feta today. First, put the tomatoes in a baking tray on some baking paper. Pour a little olive oil over them. Put them under the griller to cook. They sizzle and pop as they cook, and take about 15 minutes to get all brown and nicely done. Don't let the paper catch fire. Meanwhile, boil some water in the frying pan and cook the asparagus for 8 minutes. It is cooked when it has turned dark green. I always snap the ends off the asparagus before I use it, I like the snapping noise it makes. While the asparagus and tomatoes are cooking, I dice the onion and crack the eggs into a jug. I then use a whisk to get the eggs all nice and frothy and add some salt and pepper and dried herbs (oregano is nice) The feta cheese is probably salty enough if you'd like to leave out the salt. When the asparagus has finished cooking, tip it out into a colander over the sink then return the empty frying pan to the stove. The tomato should be cooked too so take it out from under the grill and set aside. Add some olive oil to the pan and fry the onion. I like mine nice and brown and caramelised. I find the caramelised red onion flavour a good substitute for bacon and ham in a vegetarian recipe. When the onion is cooked, it is time to assemble the fritatta in the frying pan. First I put in the asparagus spears, I alternate the lengths so they make a nice pattern and fit in well. Then I put the tomato in. Tip all the juices from the baking tray in as well. I pour the eggs in and poke them around a little bit so the mixture fills the gaps in the vegies. Then it is time to add the feta, crumble into chunks. If I had any thyme or pinenuts I would sprinkle those on top too. It sits on the stove on a medium - low heat for about ten - fifteen minutes. Tilt the pan every now and then to get the egg to run around the rim and set properly. Get the griller going nice and hot while it is on the stovetop. Try really hard not to burn the bottom of the frittata. I have done this before, and had to cut off the burned bits later. Some other ingredients which go really well in a frittata are left over vegies from a baked dinner - roast potato, sweet potato, pumpkin etc. Peas and corn would be ok if all you had were frozen veg. Sundried tomatoes and chargrilled eggplant from a jar are also good. You can add more eggs to feed more people, or less eggs. You can use normal grated cheese instead of feta. Totally adaptable. When you think it is not going to cook any longer without burning on the bottom, it is time to put the frittata under the griller to finish it off. Once more, keep an eye on it to make sure it doesn't burn. This is not a good time to wander off and hang out the washing (ask me how I know). Sitting at the kitchen bench reading a book is ok though. 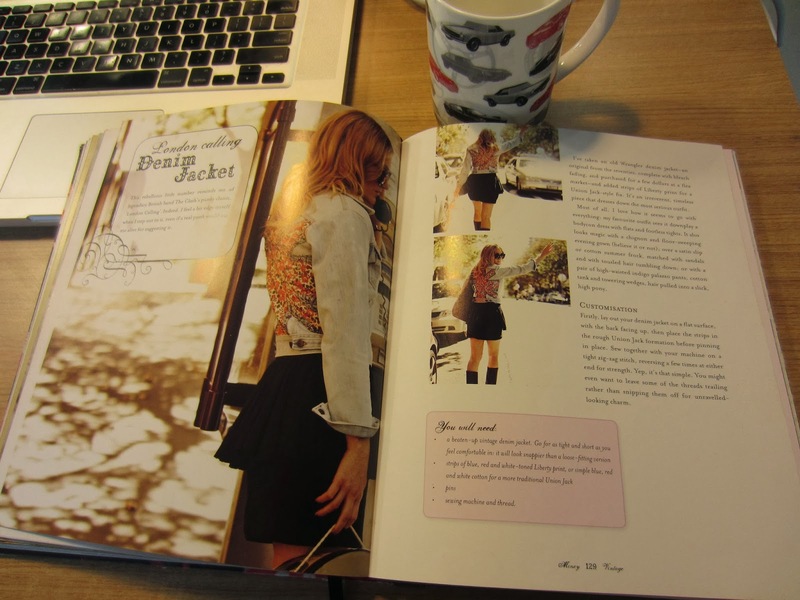 I am reading "Minxy Vintage" by Kelly Doust which is about how to alter vintage clothing to fit and look fabulous. Every now and then get the frying pan out from under the griller and tilt it. If egg runs out, it needs a bit longer. If the top is brown and bubbly, it is ready. Let it sit for a minute or three before you cut it into wedges and levering it out of the frying pan with a spatula. You can serve with a salad and bread. Last time I had mine with asparagus on the side (did I mention that I love asparagus?). I will probably cook a steak for my hubby to have with his frittata tonight, and DD said she'd rather cook a toasted sandwich (she's not an egg lover) but for a vegetarian this makes a complete meal on its own. It is just as good served cold the next day in my lunchbox at work. Happy to answer any questions, just leave me a comment below! 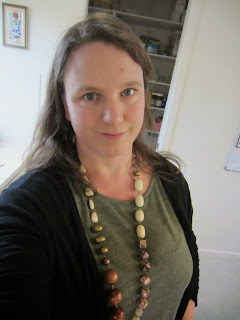 PS I scored these beads for $2 on my op shopping trip to Belconnen today - they came from the Salvos at Jamieson. In fact, my mother made me buy them, I was unsure at first but now that I think about it they match my top since they are bronze, brown, cream and a weird rusty pink colour. I think I like them! Looks delicious and I am definately going to cook it one day soon. Love the easy to follow instructions and pictures! Love the beads too! I see the next Pioneer Woman here. This is how her blog got started. I love the way you chatted us through that recipe. And the beads go well with that outfit. What a great price! 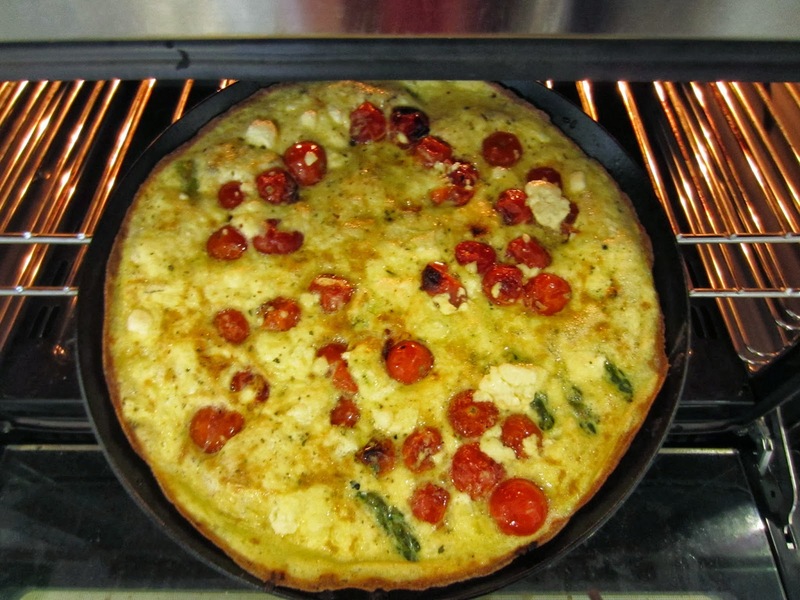 To me, fritatta is my ethnic meal. I remember my Mom making it with just eggs cooked then fried potatoes and pepperoni. That was what you did with left over potatoes. Recently I discovered a nifty substitute for the potatoes (to give it some heft) and that is left over spaghetti. You may have to rinse off the pasta if it's all saucy. Drain well, add whatever (for me, this is usually Romano cheese, lots of parsley). I can see, pine nuts, roasted peppers in this too. Your tutorial is "cyber space" worthy. Yum looks good Hannah. I love asparagus too and I like recipes that you can make your own with fave veggies. Great pics and instructions. I love frittata and haven't made it in a while. I love asparagus too but it is $3 a pound here right now! This is a great recipe though that I will try when the asparagus is reasonable! Pinning! Looks yummy! I like the color the green asparagus and red tomatoes add to the frittata. Great spring recipe! Looks good. I make a frittata every now and then -- I usually throw in whatever I have for vegs. I cook mine for just a few minutes on top of stove though and then bake it for maybe 15 minutes. I think I might try caramelizing the onions next time that looks good and the roasted tomatoes too. I bought the ingredients today and am looking forward to trying it. I agree with a previous comment that capsicum would go well to, but am going to try it unchanged the first time.